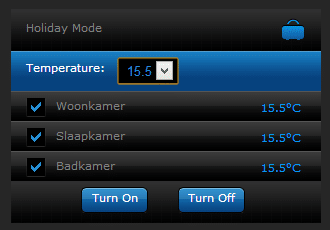 De heating in home can be controlled perfectly in combination with a home automation system. For instance with the Fibaro Home Center, Nest thermostat or Danfoss Living CC. Set the temperature easily with a smartphone or tablet anywhere in the home or from the other side of the world. Perhaps you are away for the weekend? Then you can switch the system to the holiday program. Just before your return, the settings will automatically switch to the standard program and you will arrive in a comfortably warm house.